Glass 2-Ball Baseball Case. "Each UV-protected display case is hand-made and includes a removable glass top for easy access. 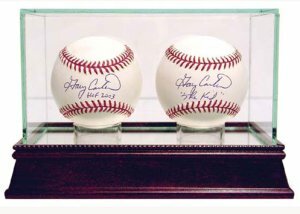 With a mirrored bottom and stunning cherry wood base, your memorabilia will look stylish and protected in any setting.This double baseball display case measures in overall size of: 8 inches in length, with a width of 4.75 inches and a height of 5.25 inches. The available space within the case is 7 inches in length, with a width and a height of 3.75 inches." Baseballs sold separately.